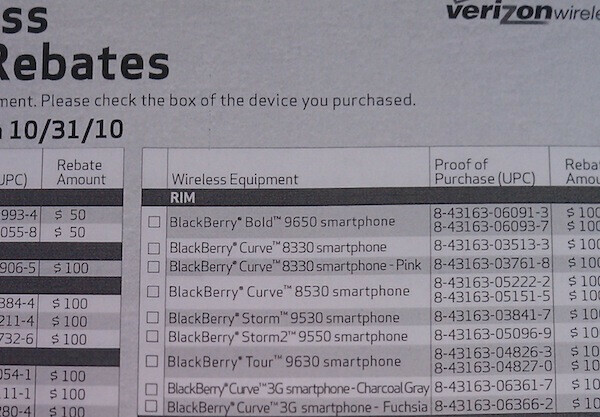 A flier leaked from Verizon shows a rebate offer for the BlackBerry Curve 3G in 2 colors, 'Charcoal Gray' and 'Fuchsia'. The expiration date on the flier is October 31st, so we should expect the device fairly soon. We have been anticipating a Verizon release since it was leaked that the 8530 wasn't long for Verizon's roster, but this might be sooner than was expected. The BlackBerry Curve 3G is the next in RIM's line of lower tier smartphones, but this iteration is basically identical to the BlackBerry Curve 8530. The only significant change is that the Curve 3G supports BlackBerry 6, with its universal search and improved web browsing.